These Texas airport map thumbnails show FAA-designated commercial service airports, reliever airports, and general aviation airports in the State of Texas. Click on each of these thumbnail maps to display detailed regional airport maps. The busiest airports in Texas are the Bush Intercontinental Airport in Houston and the Dallas/Fort Worth International Airport. 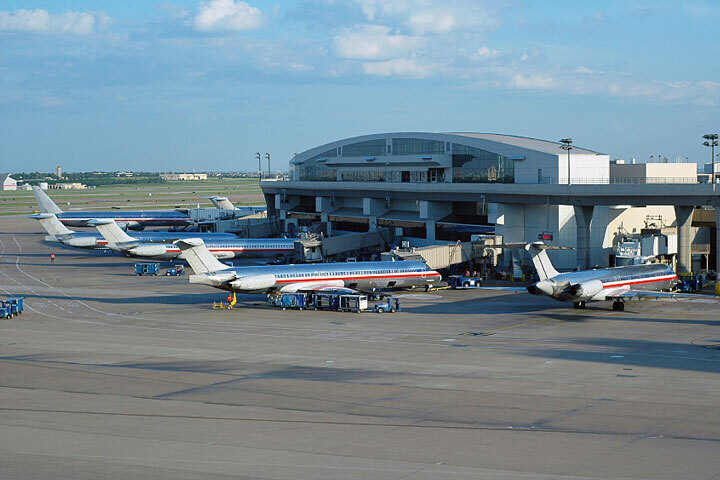 Medium hub airports in Texas include the Austin-Bergstrom International Airport, the Dallas Love Field, the Hobby Airport in Houston, and the San Antonio International Airport. Small hub airports in Texas include the Amarillo International Airport, the Corpus Christi International Airport, the El Paso International Airport, the Lubbock International Airport, the Midland International Airport, and the Valley International Airport in Harlingen. 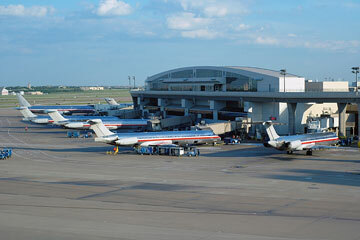 The photo at right shows aircraft parked at a Dallas-Fort Worth International Airport terminal. Texas airport map source: FAA 2001-2005 NPIAS.